Great measurement starts with good data. DM1 tracks full customer journeys. Accurately. Our system seamlessly measures and blends Shopper, Associate and PoS data. Getting the data right isn't easy. We integrate best-of-breed data collection technologies, calibrate the initial implementation and use machine learning and advanced analytics to clean the resulting data. Measurement is cost-effective (<5K for most stores) and capable of scaling fleet-wide with easy installation and low maintenance. DM1's robust metric set covers store performance and customer journey. 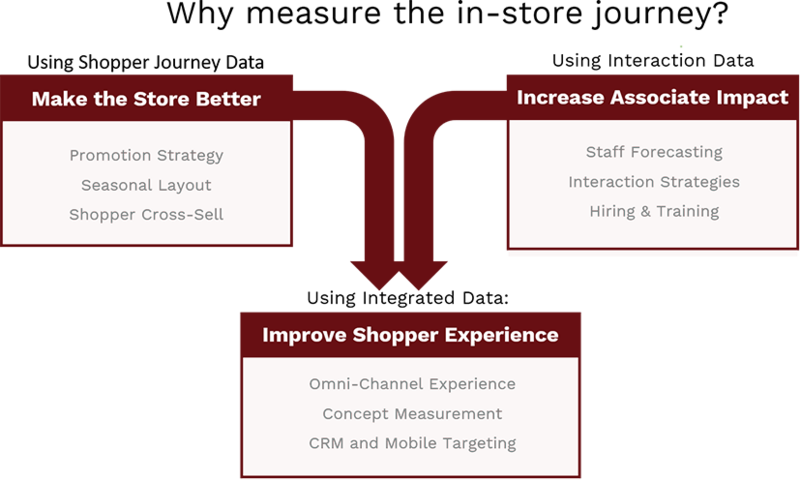 Measure every aspect of the store: traffic, engagement efficiency, conversion efficiency, and even interaction lift. Then take measurement down to the shopper journey: draws, engagement points, interaction points, conversion drivers and even exit points. Our reporting shows you exactly what’s happening inside the store. What draws shoppers. What loses them. Where your store works. Where it doesn’t. For any time period, season, time-of-day and shopper segment. 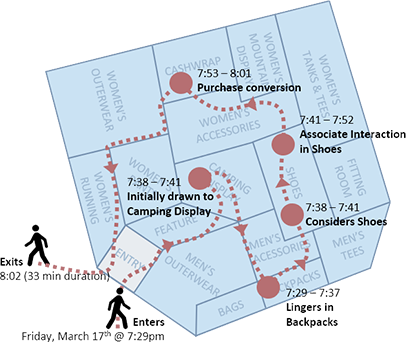 Advanced segmentation zeroes in on your key shopper populations. Flexible store-funnels show you how shoppers navigate and where they fall out. Slice any report by time, store, layout, shopper segment and AB test. Setup costs are always custom. DM1 platform costs are typically $1.5K per store/month quantity one with no limit on the number of users. Costs per store drop quickly as you add additional stores. For very large stores, arenas, malls, resorts, and other large properties, pricing is customized based on traffic and complexity. Check out the Getting Started page for more information. Does DM1 include the Data Collection? Yes. Usually. DM1 is an open platform and we’ll ingest data from camera, wifi or passive network sniffers. But we know most stores don’t have an existing collection infrastructure and it’s non-trivial to deploy correctly. So we typically package a collection infrastructure designed specifically for your needs as part of a pilot project or store rollout. Get the full scoop about Data Collection here.